In 1993 I started to teach myself HTML. I did this by going to Web pages and using the “View Source” menu option on my Netscape browser. At first what I saw was confusing, but over time it started to make sense. Within a year I could code pretty much anything you could design a mock-up of in Photoshop. At the time, if you wanted to do anything interesting (i.e. interactive) with a Web page, you had to deal with Common Gateway Interface (CGI). I poked around to see what this CGI stuff was all about, but ran into walls. These walls were in the form of complex instructions that mostly went over my head and left me feeling bewildered. Tonight, 22 years later, I set my foot on the path of Responsive Web Design. But rather than just find some responsive sites and view their source code to begin to pick it apart, I decided to look for information on the “Fundamentals of Responsive Design” (that was my actual Google search). I wound up at Udacity.com, with it’s promise of video lessons teaching “Responsive Web Design Fundamentals” in six weeks, with over 16,000 fellow students. I’m a big fan of video-based learning, and even create my own training videos for attorneys and secretaries to learn about CRM systems. So I was excited when I noted that the video tutorials are free. 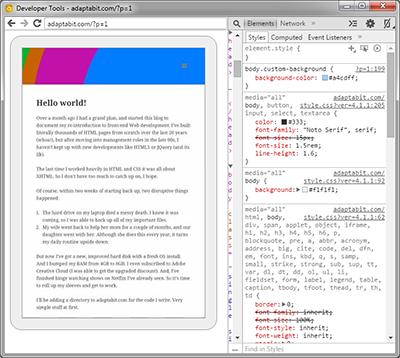 I signed up and got started right away, ready to understand the underpinnings of responsive Web pages. This sounded straight forward, but my Windows 7 machine couldn’t find all the drivers for my Nexus 7. So I had to click around to figure out how to manually add the drivers. First I downloaded and installed Android Studio, because on the page I was referencing, it indicated that I could find the drivers in the Android SDK directory. During the installation of Android Studio, it told me that I need a recent Java Development Kit installed. So off I went to get that. Then back to finish the Android Studio install. Once installed, I looked for the folder containing the USB drivers for Android on Windows 7. This failed to turn up in any search. Then I remembered that Android Studio has an SDK Manager feature, which allows you to download various packages, and sure enough, the USB drivers were a package that had not been installed initially. I downloaded that package, but was still unable to locate it on my hard drive. After digging around online, I found another page that offered a direct download of the Android USB drivers. Finally, I got the driver for my Nexus 7 installed. Then went back to Chrome Canary and tried the “chrome:inspect” command again. My Nexus 7 failed to show up in the list of devices. After hunting around on various forums, I found a page where someone had the same issue. People recommended various fixes, including the installation of a Chrome extension. I wanted to avoid any more installations, if possible, so I opted to try a simple fix recommended by another user. This involved simply disconnecting my Nexus 7, turning off—and then back on—the USB debugging feature, and then reconnecting it. Well, that worked. And I was able to see the page on my Nexus 7 screen in a window on my computer. That was great, but two hours had gone by, and I didn’t have energy left to get back to the Udacity tutorial. All I could think about were the many times in the past that I’ve had to jump through similar hoops just to start to learn some new aspect of development. I don’t like it. Oh, and to top it off, I got locked out of the backend of this WordPress blog, because I previously installed a security plugin that locks access for a period of time on a set number of failed login attempts (not even consecutive). So that was just the perfect ending to an evening of struggling to learn and document more about current front-end development practices. Tomorrow I may ditch the Udacity tutorial altogther, and just look for something more simple. Or, since I’ve already put so much effort into it, I might pick up where I left off. We’ll see tomorrow. Over a month ago I had a grand plan, and started this blog to document my re-introduction to front-end Web development. I’ve built literally thousands of HTML pages from scratch over the last 20 years (whoa! ), but after moving into management roles in the late 00s, I haven’t kept up with new developments like HTML5 or JQuery (and its ilk). The last time I worked heavily in HTML and CSS it was all about XHTML. So I don’t have too much to catch up on, I hope. The hard drive on my laptop died a messy death. I knew it was coming, so I was able to back up all of my important files. My wife went back to help her mom for a couple of months, and our daughter went with her. Although she does this every year, it turns my daily routine upside down. But now I’ve got a new, improved hard disk with a fresh OS install. And I bumped my RAM from 4GB to 8GB. I even subscribed to Adobe Creative Cloud (I was able to get the upgraded discount). And, I’ve finished binge watching shows on Netflix I’ve already seen. So it’s time to roll up my sleeves and get to work. 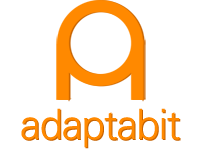 I’ll be adding a directory to adaptabit.com for the code I write. Very simple stuff at first. For a change of pace, I’ll be updating this WordPress theme, or finding a new one to use and customize. I have lifetime subscriptions to both ElegantThemes.com and Theme-Junkie.com, so I’ll probably work with one of those themes first. Then I’ll create my own from scratch (I’ve done it before). I also have a client I’m doing work for: A solo-practice attorney for whom I’m providing marketing technology support. As that work progresses I’ll highlight it here as well. Posted on May 2, 2015 May 4, 2015 Leave a comment on Hello world!